*NEW* 58"w x 88"L Flat Deck with 44" High Rear Heavy Duty Ramp Gate, Manual Tilt / Dump Bed, GVW 2000 lbs, Carry Capacity 1400 lbs, Approx. 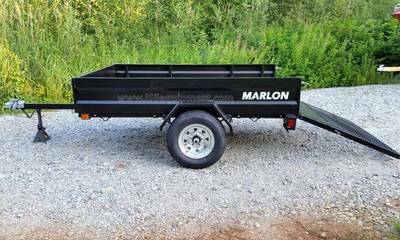 Trailer weight: 600 lbs, Overall Width: 77", Overall Length: 136" ,Quick Release Gate Pins, Full Metal Checker plate Floor, Quick Lube Hub, Heavy Duty Light Protectors, 2" coupler, 4 prong electrical hook up. 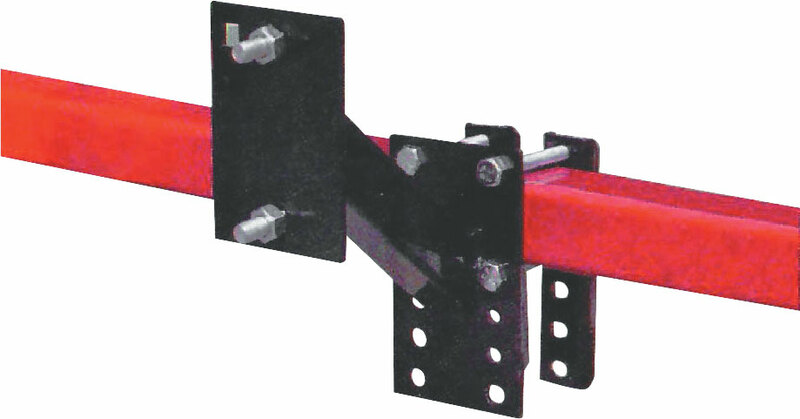 Includes Side Wall Kit option, front flip down gate to extend carry length. 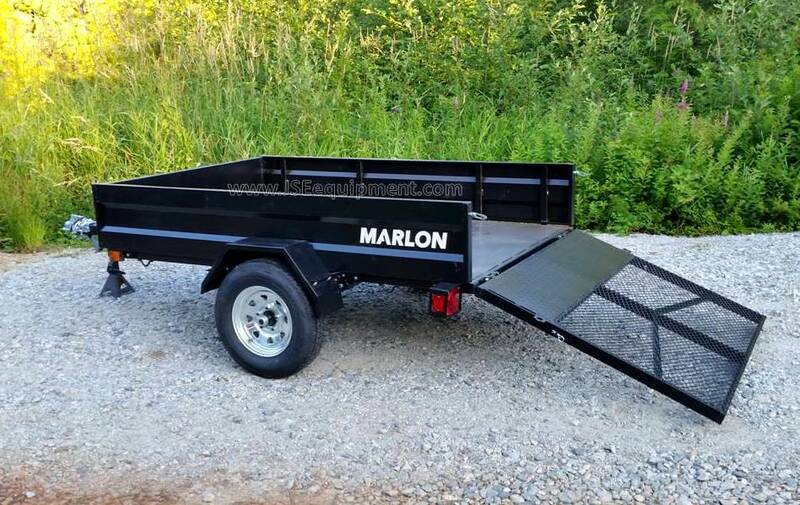 Features: An amazing curb weight of only 200 lbs! 4'W x 8'L Tilt Deck loading with locking pin, Aluminum tie down tabs welded to the frame, Fully treated marine grade 1/2” plywood decking, Optional Front stop Guard included, Overall Width: 63", Overall Length: 144", GVW 1490 lbs, Payload Capacity 1290 lbs, 4.80 x 12" Wheels, Deck height 18.5", 4 prong flat electrical, Tongue Jack optional. 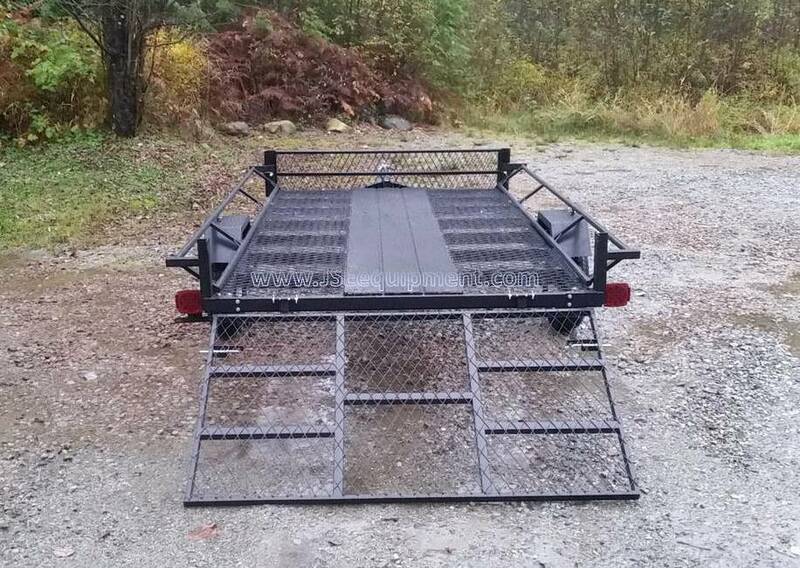 *NEW* 5' x 9', 2 place side load ATV trailer, or rear load a UTV, 2 Removable Expanded metal heavy duty self storing loading ramps, Angled side rails, Rear Ramp, Deack area: 5'W x 9'L, GVW: 2522 lbs, Curb Weight: 579 lbs, Payload Capacity: 1923 lbs, Upgraded 3500 lb axle for durability, Overall Length: 178", Overall Width: 79", C Channel frame , ST185/80R13C Radials, Integrated Spare tire carier, 2" Coupler, Metal Mesh deck, 4 prong flat electrical, Full LED Lighting, Integrated spare tire carrier, Approx. 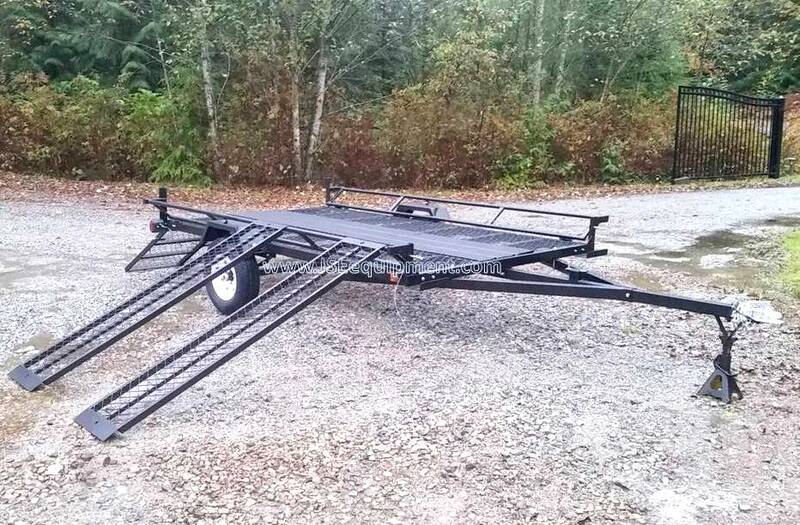 Hitch height: 19", Tongue Jack optional. 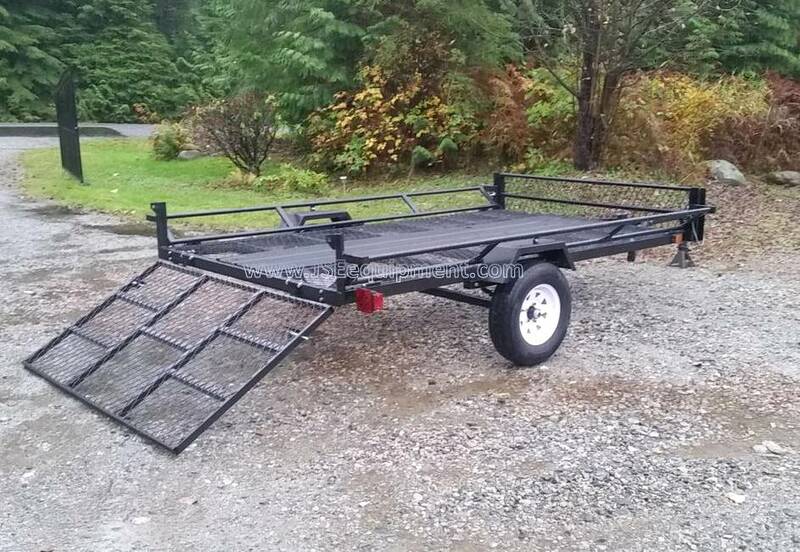 *NEW* 6' x 10'6" ATV Trailer, 2 place side load ATV's, or rear load a UTV, 2 Removable Expanded metal heavy duty self storing loading ramps, Angled side rails, Rear Ramp, Deck area: 6'W x 10'6"L, GVW: 2620 lbs, Curb Weight: 683 lbs, Payload Capacity: 1937 lbs, Upgraded 3500 lb axle for durability, Overall Length: 201", Overall Width: 91", Tube Box Frame with C Channel cross members , ST185/80R13C Radials, Integrated Spare tire carrier, 2" Coupler, Metal Mesh deck, 4 prong flat electrical, Full LED Lighting, Integrated spare tire carrier, Approx. coupler height: 19", Tongue Jack optional. Features: Nice trailer for dual purpose ATV, Side by Side, or Snowmobile! 64"W x 10'L Cargo Bed, Tilt load deck with spring assist kit installed, Aluminum Construction, Four D-ring tie downs​, 1/2" Treated Marine Grade plywood deck, LED lights installed with rubber grommets, OA Width: 82", OA Length: 164" 2090 lb GVW, 370 lb curb Weight, Approx. 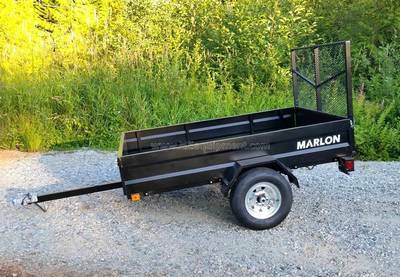 1720 lb Payload Capacity, Upgraded 13" Radials on Galvanized Rims, Polymer Fenders, 2" Coupler, Approx. 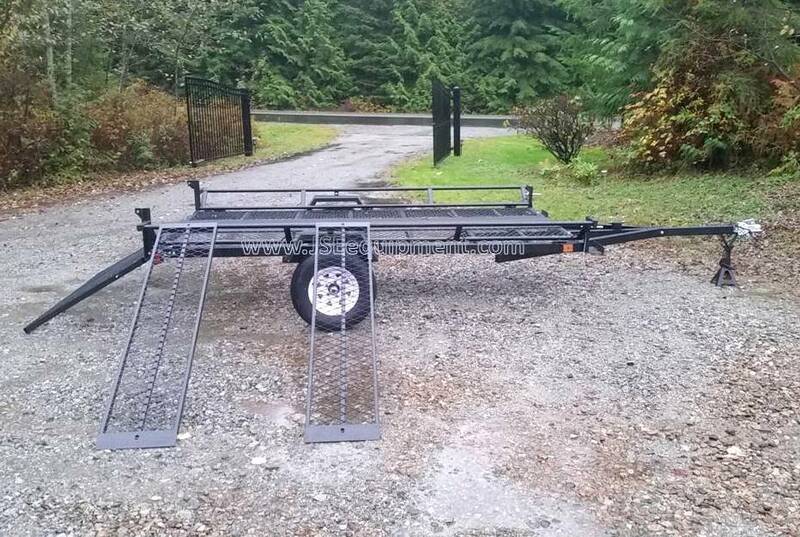 Hitch height: 17", 4 Prong Electrical connector. Tongue Jack optional! *NEW* ON SALE! 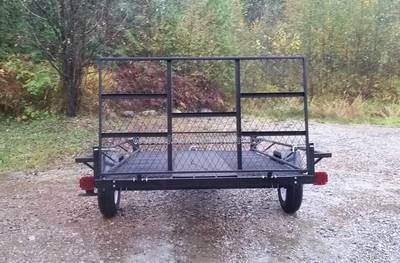 Triton ATV88-TR Twin Ramp version, 2 Place side load ATV Trailer, or rear load. 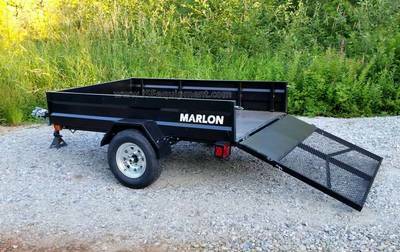 Features: Twin ramp Version for easier loading, full-length adjustable tie-down positions, Custom engineered aluminum extrusions, Patented ramp clamp storage system designed to reduce noise when hauling. 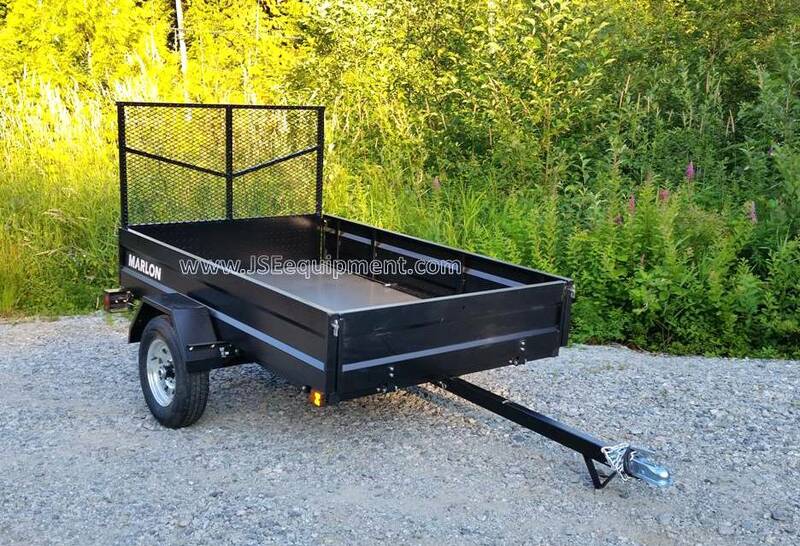 Bed dimension: 79"w x 104"L, Aluminum Construction, 1/2 Treated Marine Grade plywood decking, ST145R12 Radial Tires, OA Width: 79.75" , OA Length: 150", Deck Height: 22" 1900 lb GVW, 410 lb curb Weight, Approx. 1470 lb Payload Capacity, 2" Coupler, 4 Prong Electrical connector. Tongue Jack optional! 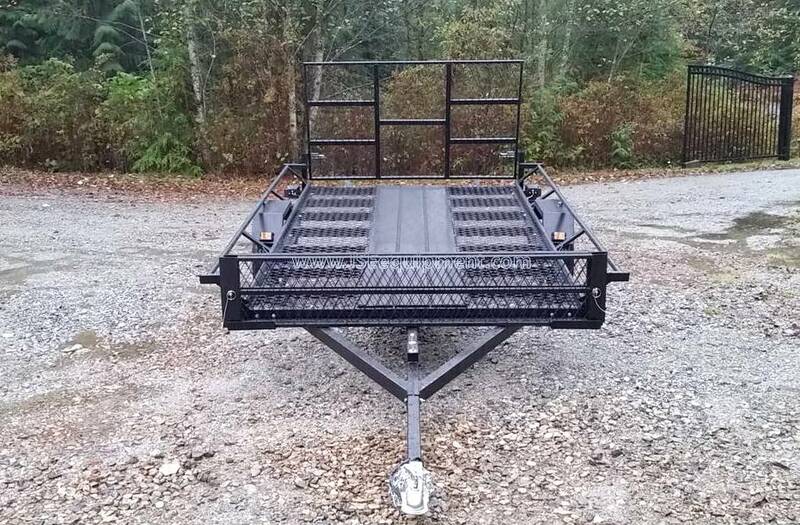 KPU 2990-72-12 Full tube Frame, Flip down sides with locking pins to allow for easy side loading from either side, Removable rear ramp gate with anti-Rattle Latches, Remove the sides and ramp for a flatdeck! Treated Wood Floor, 2990 lb GVW, 983 lb curb Weight, Approx. 2007 lb Payload Capacity, Overall Width 7' 11", Overall Length 16', Polymer Fenders, 2" Coupler, 4 Prong Electrical connector. Tongue Jack optional! 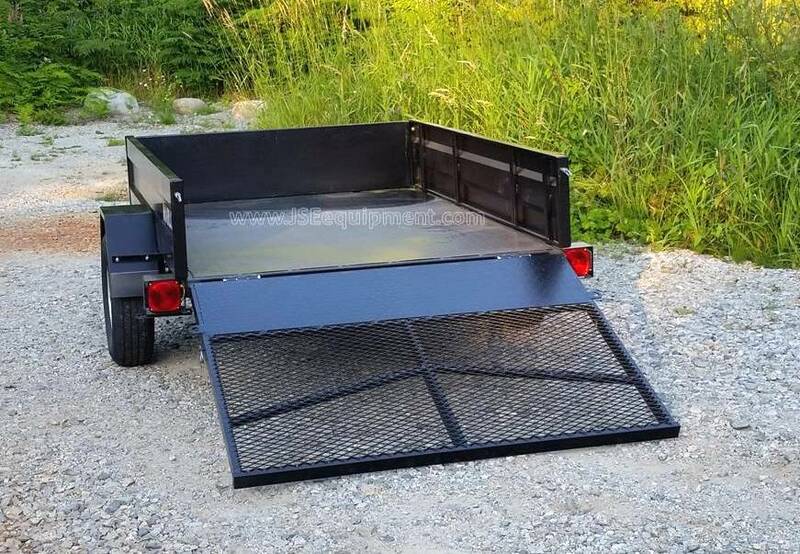 Features: 64"W x 10'L ATV & UTV / Utility Trailer, Rear ramp gate, Full Aluminum Construction, Aluminum Decking = No rot!, OA Width: 85", OA Length: 165" 2200 lb GVW, Approx. 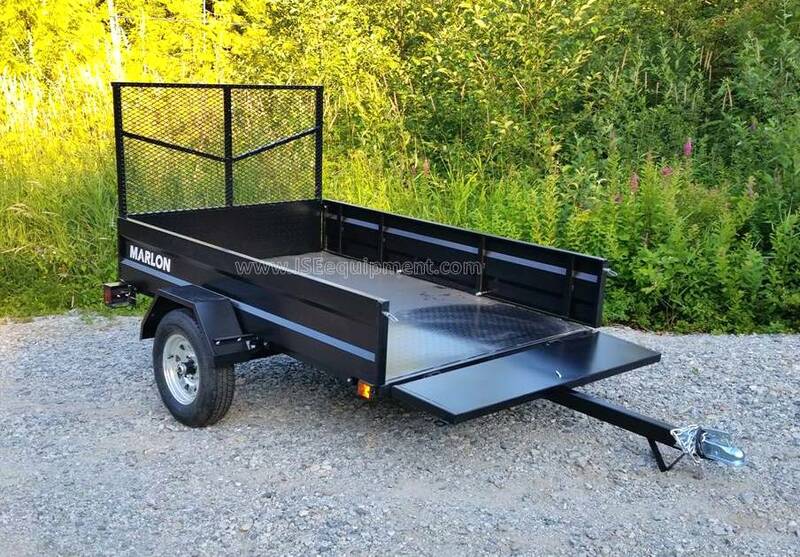 Curb Weight: 400 lb, Payload Capacity: 1800 lbs, ST175/75R13C Wheels, Polymer Fenders, LED Lighting, 2" Coupler, 4 Prong Electrical connector. Tongue Jack optional! 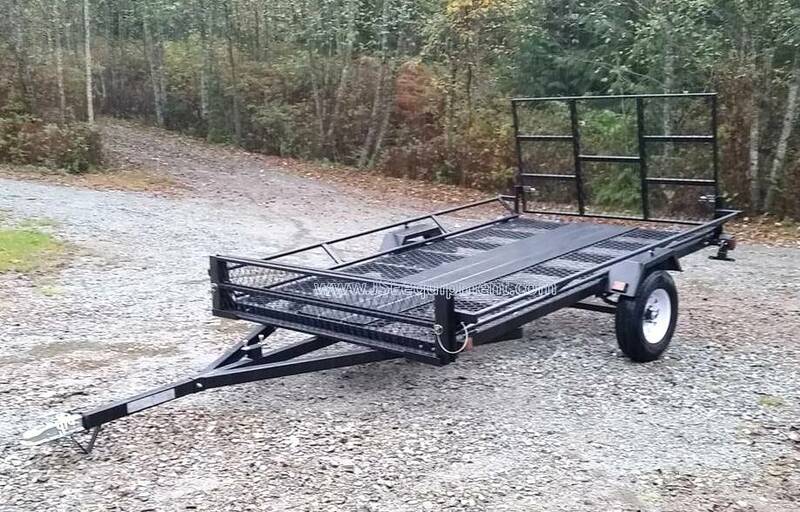 Features: 82"W x 12'L ATV / UTV / Utility Trailer, Tilt Deck is Soft, precise motion system, Full Aluminum Construction, Aluminum Decking = No Wood ROT, Quickslide Tie down channels in the deck, Bed Dimensions: 80.75"W x 144"L, Width: 102", OA Length: 192", 2995 lb GVW, 700 lb curb Weight, Approx. 2295 lb Payload Capacity, Smooth Ride Torsion axle, Polymer Fenders, 2" Coupler, Full LED Lighting, 4 Prong Electrical connector. Tongue Jack optional!